HomeBoard GamesIf you can’t rule the world, Destroy it! In Plague Inc. you take the role of a deadly plague, your one goal, to wipe out humanity! How you choose to do so is up to you in this tabletop version of the much loved mobile app Plague Inc.
Plague Inc. The Board Game is a strategic game of infection, evolution and extinction for 1-5* players lasting 60-90 minutes. Each player is a deadly disease competing against other players in a battle to be first to infect and wipe out the world! Based on the bestselling video game ‘Plague Inc.’ with over 70 million players worldwide, Plague Inc: The Board Game combines the best bits of the original game with a unique tabletop design. 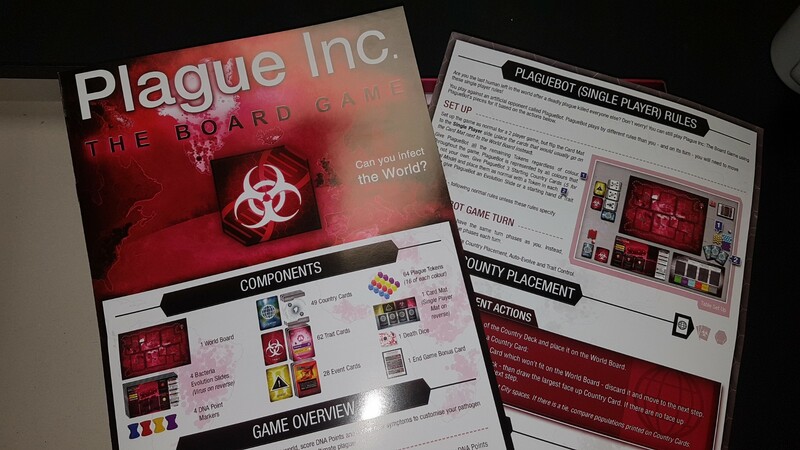 The result is a game with a realistic theme and engaging game play which can be enjoyed by anyone who likes the idea of infecting people with the plague! Upon opening the box there is a small rules pamphlet, there isn’t a great deal of intricate rules to learn so it should be a fairly quick and painless experience to get playing with a group of friends (or using the enclosed solo rules by yourself). Digging under these rules you will find the double sided player cards, one side is if you are going to be a bacteria, the other side is for those players who want to play as viruses, hopefully other bits from the digital game will become available as add ons like parasites and bio weapons, and the world game board. This just leaves the player pieces, country cards, traits and world events. Now unlike the digital version where you win by wiping out every human alive, in the tabletop version you win by having the most DNA points, with a few bonuses thrown in along the way, the best way to achieve DNA is by controlling countries (having the most tokens on it), and killing the countries, this scores one DNA for each of your tokens on it. 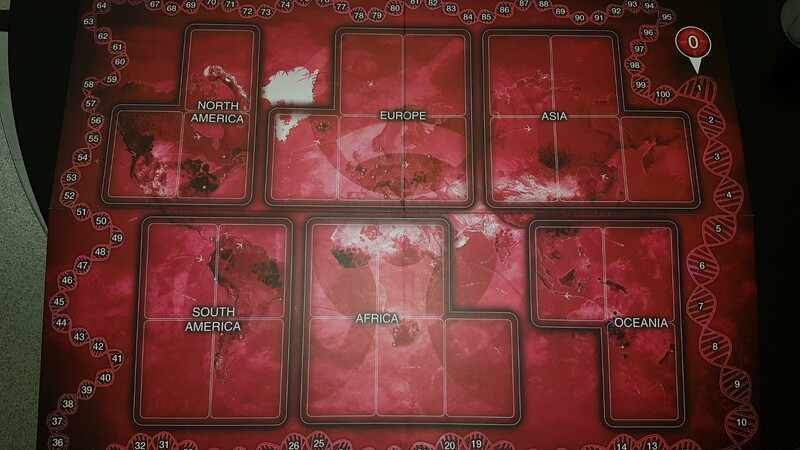 Once the final Country card has been placed/discarded, the world begins to collapse and the game immediately enters sudden death, when in sudden death the game will come to an end if any player is eradicated (has no pieces left on the board), or if any player is unable to make a move by placing a token or by rolling the death dice. Event cards allow special things to happen through out the game which may or may not help you along drastically, but add a lot of flavour and unpredictability to the game.